We should be in Paris. That’s where the heady couture ateliers of our imagination are all based – or, at a stretch, Milan. But I was further east than European fashion’s centre of gravity: in an Athenian apartment on the edge of the Plaka. If I craned my head out of Atelier Loukia’s window, I could see the bulge of the Acropolis above the rooftops and the hordes of tourists dotting it like ants. I was in Athens for work and considering buying my first ever couture gown. As a freelance journalist, that is not a sentence I ever thought I would type, but Athens’ rapidly growing made-to-measure industry is aimed at those who don’t grace the pages of Tatler. You may ask – what’s the point of couture in 2018? Countless newspaper columnists and trend analysts have already questioned the role it can play in an industry increasingly obsessed with speed to market, Instagram hype and dressing down. Not to mention the fact that AI is forecast to soon log our measurements and churn out pieces of perfectly fitting, affordable clothing on demand. But in an era of Asos and Amazon, I found myself drawn to the luxury of handcrafted, beautifully made clothing that actually fit my body. And this was an urge I could indulge in in Athens, where you can order a demi-couture dress for as little as €700. Or, more likely in my case, ask a seamstress to copy one from a photograph for as little as €70, plus fabric costs. This is in comparison to the six, or even seven-figure sums you would be expected to pay for its equivalent in France. 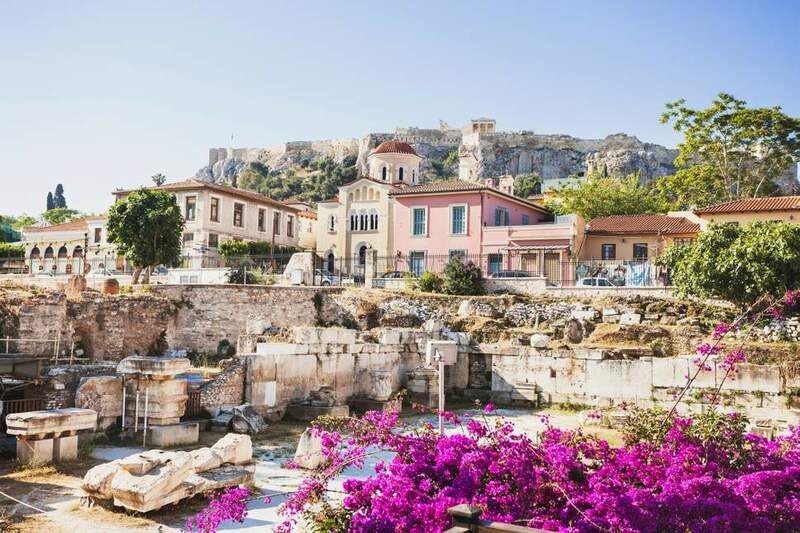 And like Paris, all around the Greek capital there are a variety of specialist ateliers, each with a distinct skill such as feather-making, button-making, millinery, knitting and glove-making. And in Kolonaki, Perikleous and Psychiko – leafy boroughs of Athens – designers are working with these craftspeople to create individual pieces of clothing that begin with a watercolour sketch and end with a canary-yellow silk dress or a scarlet-lined three-piece suit. Some – like Atelier Loukia, Celia Kritharioti and Costarellos – are reminiscent of a fashion-filled Charlie and the Chocolate Factory, with endless rooms of brightly coloured silks, rainbow hued buttons and thousands of embroidered shoes, hats and bags. Others occupy just a single studio space with one glowering seamstress dressed in black. Falling firmly into the former camp is Deux Hommes, a label run by Dimitris Alexakis and Grigoris Triantafyllou who make extravagant evening wear out of embroidered silk, rich velvets, chiffon and sequins. Or there is Celia Kritharioti – one of Athens’ most respected designers, who has created pieces for Jennifer Lopez, Gwyneth Paltrow, Heidi Klum and even Kim Kardashian.